As your humble No Fenders scribe tries mightily tearin’ himself away from those lingering images of WARM, DRY & SUNNY Hawaii - whilst in the midst of another DARK ‘N GLOOMY Pacific Northwest winter... A ‘llittle while ago; Whale HELL! A long while ago as in (2011) Pre-Indy 500 - whilst having a chat with CARPETS, we came upon an interesting subject – as in what drivers are still left from a decade ago? Or how many drivers from that first dubious Indy Racing League Indy 500 are still in the game? As all of this was derived from my comment towards I wish that the Indianapolis Motor Speedway would announce a listing of the confirmed 269 living drivers planning to honour their IMS invitations for this year’s world’s largest autograph session. And do names such as Marco Andretti, Ed Carpenter, Wade Cunningham, Jay Howard and Alex Lloyd count towards the Indy Racing League’s side of the ledger, i.e. ; Indy Pro Series/Indy Lights, eh? Thus, how can we compare ‘N contrast these two past Feuding entities? As according to my (somewhat?) quick research; Championship Auto Racing Teams (CART) ran a total of four 500-mile events that season; Motegi, Japan; Lausitz, Germany; Rockingham, Great Britain and Fontana, CA. Meanwhile, the Indy Racing League (IRL) ran a total of four 500-miler’s – Atlanta, Indianapolis and Texas, twice. And thus, I’ll use the Twin Rings Motegi race – run on May 19, 2001 as the yardstick to compare vs. the 85th running of that year’s Indy 500; May 27, 2001 to see just how many drivers from those two warring factions would be participating at this year’s Centennial of the Indy 500 – which contrary to the overly ‘Hyped babbling of the media, is NOT the 100th running – as something known as World War One & Two got in the way... With NO races being run in 1918 and between 1942-45, hence making this year’s Centennial the 95th running of the Indy 500. Team Penske: No. 1) Gil de Ferran, No. 3) Helio Castroneves; Chip Ganassi Racing: No. 4) Bruno Junqueira-R, No. 12) Nicolas Minassian-R; Walker Motorsports: No. 5) Toranosuke Takagi-R; Newman Haas Racing: No. 6) Cristiano da Matta, No. 11) Christian Fittipaldi; Team Rahal: No. 7) Max Papis, No. 8) Kenny Brack; Bettenhausen Racing: No. 16) Michele Jourdain Jr.; PacWest Racing: No. 17) Mauricio Gugelmin, No. 18) Scott Dixon-R; Patrick Racing: No. 20) Roberto Moreno, No. 40) Jimmy Vasser; Sigma Autosport: No. 22) Oriel Servia; Arciero/Blair Racing: No. 25) Max Wilson-R; Team Green: No. 26) Paul Tracy, No. 27) Dario Franchitti; Forsythe Racing: No. 32) Patrick Carpentier, No. 33) Alex Tagliani, No. 77) Brian Herta; Team Motorola: No. 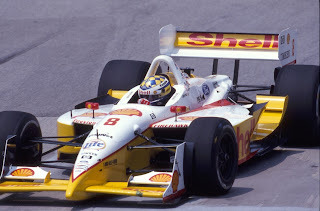 39) Michael Andretti; Fernandez Racing: No. 51) Adrian Fernandez, No. 52) Shinji Nakano; Mo Nunn Racing: No. 55) Tony Kanaan, No. 66) Alex Zanardi. Dale Coyne Racing only contested Rounds 1-2 with Michael Krum & Luiz Garcia, Jr. Memo Gidley replaced Nicolas Minassian for second half of season at TCGR. Townsend Bell made his rookie debut for Patrick Racing in Dale Coyne’s No. 19 during season’s final two events as a tuneup for his “Full-season Gig” at Patrick in 2002, after winning that year’s Indy Lights title. Alex Barron replaced Max Wilson for season’s final two events at Arciero/Blair Racing. As many may know, the 2001 season was full of turmoil, most notably the HORRIFIC accident that nearly claimed the life of Alex Zanardi, along with the crushing accident Davey Hamilton endured. And the Texas Motor Speedway was a vicious venue that year, not only causing Hamilton to undergo some 21+ surgeries and reside in a wheelchair for a year... But it also caused CART to cancel its planned event due to the dizzying speeds causing drivers to experience vertigo and have many report blacking out from the continuously high speeds (G-Forces) they were achieving. Meanwhile, this combined group of drivers have some pretty amazing credentials behind them, with some arguably claiming the most prolific to be ‘HULIO’s feat of winning three Borg Warner trophies for The Captain, (Roger Penske) although I’m guessing somebody named PT will still dispute that, eh? Hya! And Y’all don’t think Bryan Barnhart’s letting Paul Tracy complete his qualifying run to make this year’s Indy 500 before going Yellow due to RAIN was Payback for their Officiating MUCK-UP at Long Beach, eh - Dooze Yuh? Which obviously PALES in comparison to either Edmonton or Loudon - take your pick! * = Junqueira gets HOSED by Mikey Andretti’s decision to BUY Bruno’s ride in order to install “BULLY-RAY” (Ryan Hunter-Reay) in order to make sponsors DHL & Sundrop happy; BARF!